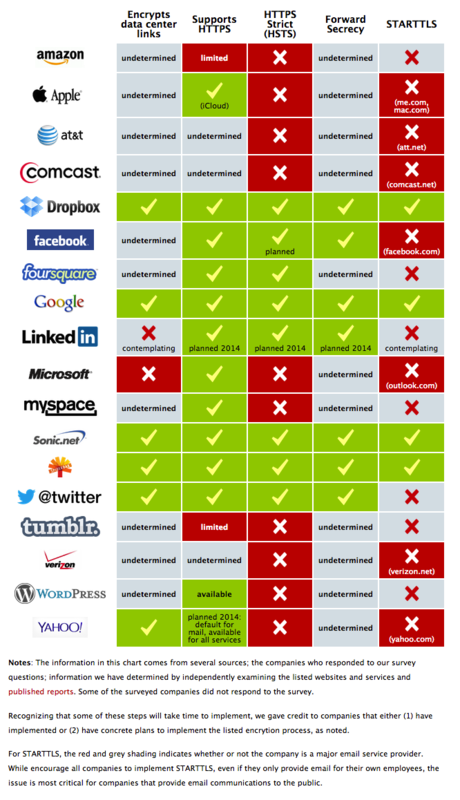 EFF's Encrypt the Web Report: Who's Doing What. EFF asked the companies in their 'Who Has Your Back Program' what they are doing to bolster encryption in light of the NSA’s unlawful surveillance of our communications. They were pleased to see that four companies—Dropbox, Google, SpiderOak and Sonic.net—are implementing five out of five of EFF's best practices for encryption. Posted in Personal blog and tagged with EFF, Electronic Frontier Foundation, Privacy, NSA, Cryptography, Online Privacy, Browser privacy, Freedom, Freedom of Speech, Encryption. November 26, 2013 by Emiel Sondag.